Hangzhou, 06/12/2018. Today I first shopped an Alibaba show-case-shop, and later in a hema market in Hangzhou, China. The show-case was about face- and RFID-recognition: We entering the shop, the doors open after face recoginition (and credibility-control). You go through the shop and pick the things you want to buy. Then, you turn to the exit. There is no cashier. You go through a RFID-Sensor, as you already know it from most malls, and then, there is face recognition again. The door opens and you are good to go. The amount of the purchased goods will be automatically drawn from your account. Very convenient, but – with regard to privacy – scary, too. In the hema-market, there was no face-recognition. At least, you did not feel it. It seemed to be a common, but very orderly grocery store. All goods beautifully presented in lots of transparent plastic cases. Very common, too, there were scancodes on all of the cases or plastic wrappers. Many employees whirring around. The store well filled with about a third of the people being employees, noticable by their uniform-like mint-blue poloshirt, and two third common customers, like me. Suddently a rattling sound from the ceiling – and a bag flew by on the ceiling-mounted conveyor-belt. And then, I saw, what these many employees did: Hold their smartphone in the hand, they were packing bags. 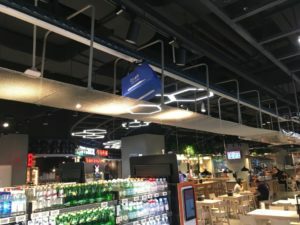 When a bag was full or the order was complete, they went to one of many pillars of the hall, where the conveyor-belt entry-points were placed. 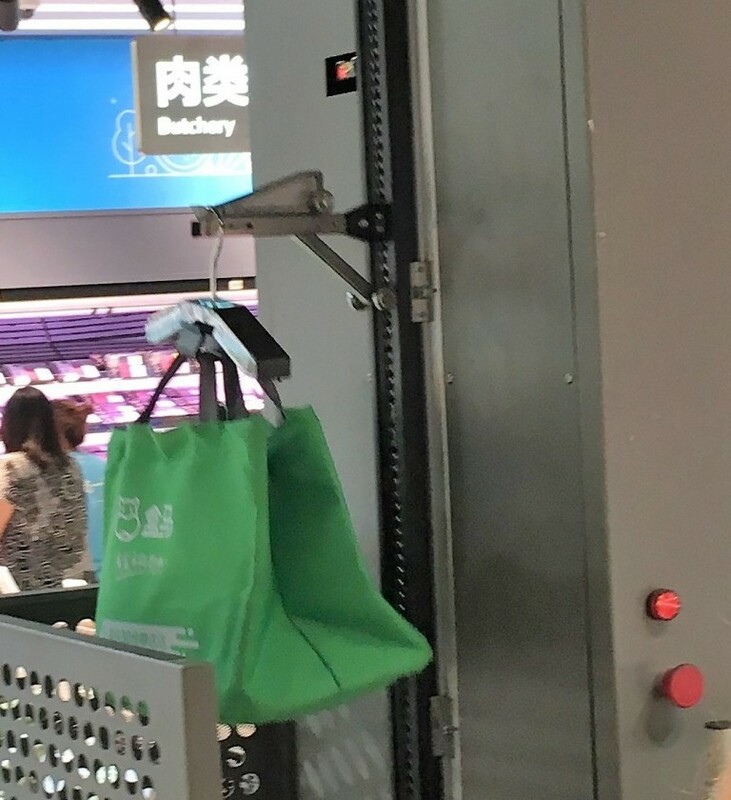 With a coat-hanger-like lift, the bag was pulled into the air and then the bag was transported out of the store into a cooled delivery zone, where the bags either waited for being picked up, or into another zone, were drivers picked the bags and drove them to home of the buyer. This service is offered in a 1.9 miles radius around the shop. When you prefer to see, what you’re buying or when you enjoy shopping as a process of inspiration, like I do, you still go into the shop. 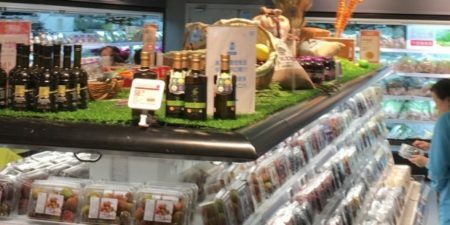 You pick your smartphone, scan the codes on the plastic cases or wrappers, and the hema-app will give you several insights. First: Where does this product comes from. You can see, which farmer grew it or which fisherman trawled it. Text only, so far. You can see the time and date, when it was shored (seafood: typically less than 8 hours ago) or harvested. In addition you can see the whole supply chain, how and when it was transported to this store, before you picked it from the shelf. More importantly, the app offers you several receipts and recommendations, how to prepare a dish with this special type of food. 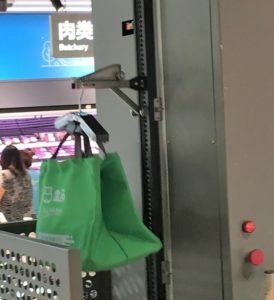 And if you are really hungry or enjoy the experience, you go to one of the show-case kitchens at the back of the store, where a cook will cook the receipt for you. And of course one could add AI-based recommendation engines, which don’t only show a few random receipts, but the ones, you personally most likely will like, depending on your taste, the time and weather of the day. In addition to the cooks in the kitchens, I would offer „supervised cooking“ – short format cooking trainings, based on how-to-videos, where a chef helps you with the cooking in the store, if you are struggling with the receipt. And next time, you will be able to cook it at home – to the excitement of your siblings. Wow! How healthy our nutrition will become! hema-stores do need lots and lots of professional content! Especially the farmers and fishers will need support – and on the long run perhaps even the different logistic partners used in the supply chain, if they want to differentiate themselves.